I love a bit of social media. No surprise there then to any regular reader of my blog. 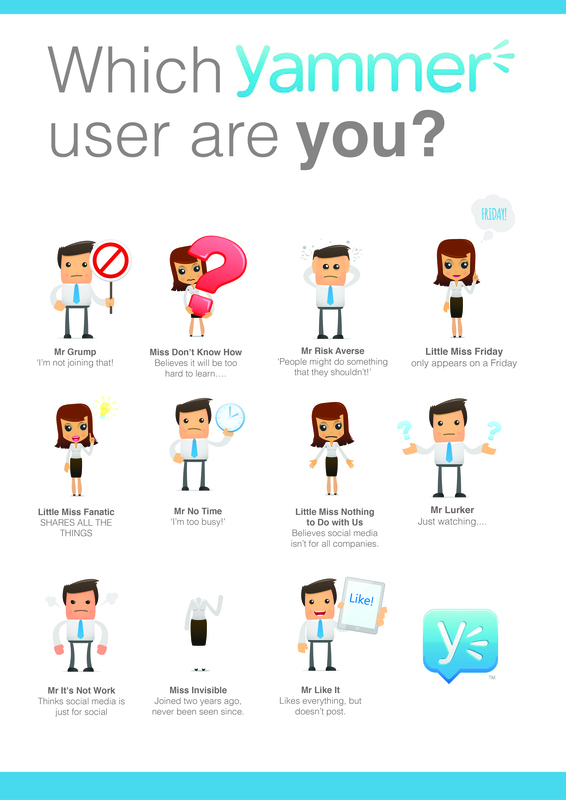 Only when it comes to internal social media networks, Yammer and the like, many of them end up being underused. Unfulfilled potential. Sometimes this is acknowledged. Sometimes not. See this great slide share from Paul Taylor detailing the signs that you are not a social business. Like with any people stuff, there are some great examples of organisations that have made their internal social networks really deliver. But many places are not even close. Why? There are lots of reasons. And many of them aren’t specific to social networks either. Sometimes it is about employee’s engagement with the broader organisation. Or lack thereof. Sometimes it is about a lack of digital and social skills generally. Sometimes it is about having the time to engage in anything other than the immediate task at hand. When it comes to the social network itself….. Sometimes it is about employees not having a clue what the heck it is for or what they are supposed to do with it. Sometimes it is about practically not knowing how to use a social network. Sometimes it is about the network being seen to be Somebody Else’s Problem. HR or Internal Comms being top of the list of suspects. Sometimes it is about line managers not letting people use them because they think it’s not proper work. Whatever that is. Sometimes it is that the organisation hasn’t launched it properly, given people a reason to go there, given it a focus or purpose – or perhaps even more importantly, it hasn’t given people the right sort of permission. It isn’t unusual in my experience to find that social networks have a small cohort of regular users, sharers and commentators. And then the rest of the organisation is either all so-what or oblivious to its existence. Get it right, and social media networks can be game changing. They can open your organisation right up, getting over the age-old complaints about communication and silo working and not knowing what is going on around here and never seeing any of the leaders. It can be a real driver of change. Of transparency. Of innovation. But otherwise, it is just something else on the to-do list, something else for people to complain about, something else that there has to be a policy for. Employees won’t care about your internal social media network unless you give them a reason to care. And even then, they still might not. Of course, a social media network does not stand alone within an organisation, it is part of the system. Often, what occurs (or doesn’t) on an internal social network is representative of what takes place within that wider system. So going back to that earlier point; if employees aren’t willing to engage on your internal social media platform, if they aren’t willing to share, to communicate, to collaborate, recognise and discuss…. just what does that say about your organisation, its leadership and its culture? This entry was posted in Social Media and tagged enterprise social networks, HR Blogs, social media blogs, Yammer by hrgem. Bookmark the permalink. Sometimes the very idea of using yet another social network might put people off, don’t you think?